Vincenzo Fasolo, "The Campo Marzio of G. B. Piranesi". ... the Via Flaminia, the only street (as far as I can tell) that is named in the plan. I think I somewhere read that Piranesi was trying to correct what he thought was a mistaken idea of where the Via Flaminia actually was. Besides the Historical connection, the street in the plan offers an interesting typological collection of plebeian houses with the occasional sprinkling of monuments and monumental buildings. An analysis of the street might disclose an interesting urban design prototype. ...the Via Flamina and its odd placement in the Campo Marzio. Fasolo refers to the placement of the Via Flaminia as arbitrary. This then also brings into question the positioning of the Equiria, (which Fasolo wrongly identified as a waterway) and how the Via Flaminia today is actually the route inscribed by the Equiria of the Campo Marzio, and how the present day Corso, whose name refers to the ancient race course (I still have to verify this) is not depicted within Piranesi's Campo Marzio but the "arbitrary" Via Flaminia seems to take its place as the "main street" of the redrawing. ...note the locations in the Campo Marzio where Piranesi actually did excavation--this information is available in Lanciani's Forma Urbis Romae. There is also the connection between the big scoop on the bank of the Tiber (depicted on the Nolli plan) and the Natatio (beach) at the same location in the Campo Marzio. ...a comparison between the Minerva Medica and the Horti Luciliani. Piranesi may be, at times, loose with what he puts where and what the buildings look like, but he is consistent in terms of finding his inspiration in actual Roman buildings. ...researched Gaius Flaminius because Piranesi's inversion of the Circus Flaminius within the Ichnographia. It turns out that Flaminius did go against the grain of the Senate and was of plebeian background. Sue Dixon also mentioned that Piranesi uses Flaminius as a point of subdivision in his Il Campo Marzio text of the districts history, (Piranesi actually thinks highly of Flaminius and his circus), and she (Sue) noted how the via Flaminia is not correctly delineated within the Ichnographia--the circus and the road were built by the same man. Perhaps Piranesi chose to delineate both these entities incorrectly to accentuate that Flaminius, in going against the grain, began a new effect on the land use of the Campo Marzio--thus showing the circus rotated 90 degrees in order to make it stand out. As for the Via Flaminia, there is no immediate explanation as to why it meanders off into a totally wrong direction, but it is worth noting the many plebeian homes that Piranesi situates along the street; this may be a reference to Flaminius' own plebeian background. 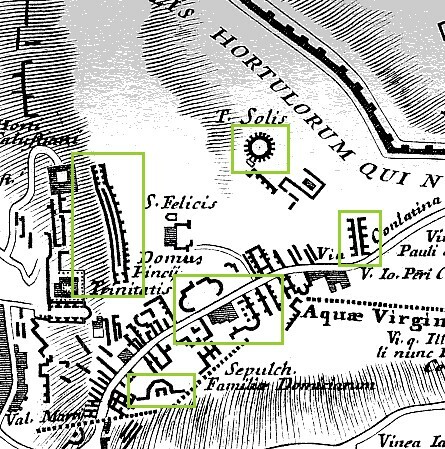 There is also the area called Prata Flaminia (within which the Porticus Philippi is situated) and I'm not sure if Flaminius also donated this land to the city/citizens. Piranesi acquired a detailed knowledge of Bufalini's Ichnographia Urbis of 1551 via his direct involvement with Nolli's Pianta Grande di Roma of 1748. A decade later, in 1758, Piranesi began his Ichnographia Campus Martius where, in some instances, he utilized Bufalini's map/plan as source material for the redrawing of ancient Rome's urban plan. Bufalini's plan, especially in the open areas all around the built-up section of Medieval and Renaissance Rome, includes 'reconstructions' of the larger ancient edifices like the imperial baths and stadiums, and some temple complexes. There are also near countless unnamed, fragmentary plans of ancient remains; remains, moreover, that, after consulting Nolli's plan, appear to no longer exist in Piranesi's time. It is from a select group of plan fragments on the Mons Pinicus or Collis Hortulorum of the Ichnographia Urbis that Piranesi imaginatively redraws the Horti Luciliani, the Sepulchrum Neronis, a Basilica along the Via Flaminia, the Horti Pincii, and the Monumentum Comitis Herculis. Piranesi's resultant redrawn plans suggest a methodology whereby the fragmentary plans of Bufalini were used as kernels of ancient fact that, in turn, galvanized newly interpreted redrawings of what once was. As suggested by Dixon, "as there were great gaps in the knowledge of the past, great leaps were then needed to supply the holistic vision of the past which was the aim of scholars--archaeologists and historians--like Piranesi. In the Ichnographia, Piranesi filled the gaps..." Futhermore, from a strictly design point of view, Piranesi used some the fragmentary plans of Bufalini as contiguous elements which, when mirror-copied and multiplied, manifest the beginnings of the new plans. Besides Bufalini's plan delineations, Piranesi also makes use of Bufalini's labelings. Bufalini labels all his full plan reconstructions of ancient buildings, often labels the fragmentary plans, and even labels blank locations (indicating the spot of an ancient edifice although actual remains no longer then existed). In utilizing the labels within the area of the Mons Pinicus or Collis Hortulorum, however, Piranesi hardly remains faithful to Bulafini's data. For example, where Bufalini positions the Horti Salustiani and Domus Pincii, Piranesi places the Horti Luciliani and, in turn, places the Horti Salustiani and Domus Pincii further east; the street Bufalini labels Via Conlatina, Piranesi labels Via Flamina; where Bufalini positions the Sepulcr. Neronis, Piranesi places the Bustum Caesaris Augusti and, in turn, labels an unnamed fragment along his Via Flaminia Sepulchrum Neronis; a small round structure Bufalini labels T. Solis, Piranesi labels Aula within the Horti Luciliani and, in turn, labels a newly imagined round building further south Delubrum Solis. It is honestly difficult to discern whether Piranesi is here playfully inverting Bufalini's data or actually rectifying Bufalini's "facts" with advanced knowledge of the past. Like Bufalini, Piranesi groups the Domus Martialis, Ludus Florae and the Templum Florae together, but he positions the group further west and moves the Domus Martialis south rather than north of the Ludus Florae. And where Bufalini locates the Sepulch. Falimiae Domiciarum, Piranesi places a very small Sepulcr. Familiae Aenobarb. and a very large Sep. Cnei Domitii Calvini whose plan Piranesi bases on an unrelated fragment of the Forma urbis. 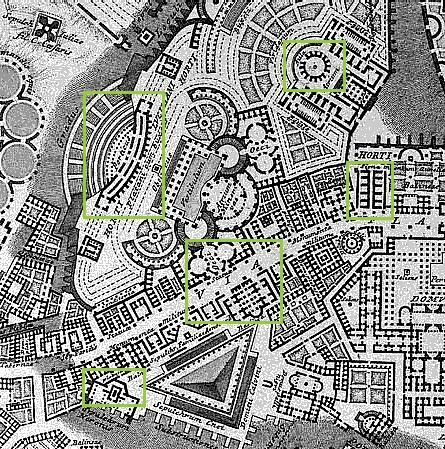 The Mons Pinicus section of Nolli's reduced copy of Bufalini's Ichnographia Urbis compared with the same area of Piranesi's Ichnographia Campus Martius.